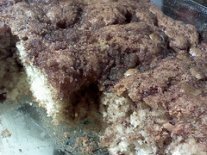 This homemade crumb cake recipe produces a moist and delicious dessert. PREHEAT oven to 350 degrees and grease a 7-1/2 x 11" pan. Blend shortening, sugar, flour and salt thoroughly. Measure 3/4 cup of the mixture and set aside for topping. To the remaining mixture, add egg and buttermilk (to which the soda has been added). Now stir in the vanilla. Pour batter in prepared baking pan and sprinkle the reserved crumb mixture over the top. Cinnamon may be sprinkled over the top if desired. If you wish, you may add chopped nuts or raisins (or both) to the batter. Bake for 40 minutes or until a toothpick inserted in the middle comes out clean.